"Wow, you look like an astronaut!" That was the first comment I heard once I was kitted up in the Megalodon Rebreather unit at Green Bay dive site. It had already been a day of excitement but now, this was the part I had really been waiting for... the future of scuba... 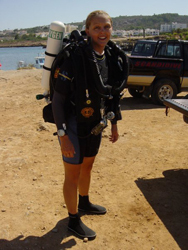 Diving a Rebreather!! 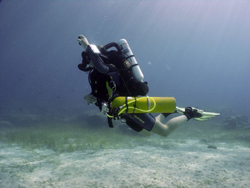 Rebreathers are different from normal open circuit units as they recirculate the air you breathe through a scrubber canister to remove the carbon dioxide from the exhaled gas. Then as the sensors detect a drop in the Oxygen levels, the solenoid injects more to maintain a constant partial pressure of Oxygen in the breathing mix. The Megalodon try-dives are a full day's event with instructor, Peter Crane. The first part of the day is spent in the classroom getting a brief over-view of the Megalodon unit, how it works, the things that you will need to be aware of while you dive and how to bail out to an open circuit system in case of emergency. In the afternoon comes the actual dive itself. A 10 minute drive from the shop to Green Bay and you are ready to breathe the future. At the site, Peter does a positive and negative test on the Megalodon's counterlungs (all the other pre dive tests have been done previously as he set the rebreather up. These are not things you need to know for the try- dive but will learn if you progress to the modular one megalodon rebreather diving course). Then, once suited and booted, you can put the rebreather on for the first time and after a bit of adjusting of the harness and clipping in, I was ready to go. Before starting the dive, the Megalodon has to be pre breathed for three minutes. This is to start the reaction in the scrubber. Monitor the handsets, ensure the set point remains at about 0.7 and breathe. For those of you who like the Technical Information, let me explain what happens in the Scrubber. For those who don’t, you can skip through the technical stuff. 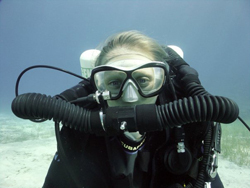 The Rebreather Loop is a moist area and the moisture in the loop reacts with the Carbon Dioxide in the Diver’s exhaled breath to form a very weak Carbonic Acid. It is this Carbonic Acid that reacts with the Sofnolime in the Scrubber Unit (a base) to produce salt, in this instance chalk (Calcium Carbonate CaCO3), water and heat. 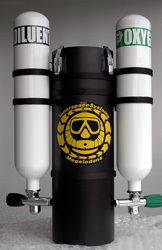 This explains why the scrubber must be changed after a set period of time (in the example of the Megalodon rebreather Unit, the scrubber must be changed every 3 hours) and why the breathing gas in a rebreather is always moist and warm, helping to prevent dehydration and keeping the diver warmer underwater. Standing up in waist deep water, we put on our fins and clipped on the open circuit bail out cylinder. After a couple of practices of bailing out, I opened the mouth piece for the final time above the water and we dropped below the surface. Buoyancy? What's that? 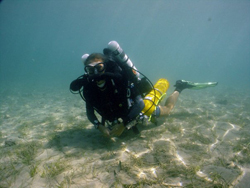 All the rules for controlling buoyancy make a runaway ascent for the surface when you dive a rebreather! You want to descend, so you breathe out to empty your lungs... but you start to ascend instead. When you want to ascend slightly to go over some rocks, you take a deeper breath... nothing. This is because your lungs are working together with the Megalodon's counterlungs. You are the pump that makes the Rebreather work so you must breathe deeply and constantly with a steady rhythm. Let’s take the example of emptying your lungs to descend slightly as you would with open circuit scuba. As you continuously exhale, you are putting more Carbon Dioxide into the loop and the Sensors will detect a drop in the Oxygen levels in the loop. This will cause the Solenoid to fire to increase the Oxygen Levels and is therefore adding more gas to the loop. Since the rebreather is adding gas and your exhaled gas isn’t released you find yourself becoming more buoyant instead of less. So that golden rule of continuous breathing when you scuba dive becomes ever more apparent when you are diving the rebreather. Many other factors such as depth, lung volume and even Partial pressure of oxygen contribute to your lack of control over buoyancy but let's just say that diving a rebreather for the first time can make the most experienced open circuit diver feel like a complete beginner. I was trying to Dive the Rebreather but I think really, the Rebreather was diving me! Once you get used to the unit and your lack of control, you begin to really enjoy the dive. Swimming along, fish were coming right up to my face, probably intrigued by this bizarre creature that looks like a diver but has no bubbles like the rest of them. Even the big school of barracuda that has taken up residence in Green Bay were within grabbing distance at certain points in the dive. Silence! Diving has always been peaceful and a means of getting away from the noise and hustle on land. 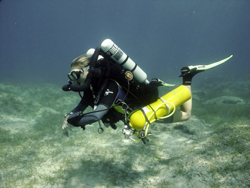 Rebreather diving takes it to a whole new level. Gone is the loud sound of your own breathing to be replaced by the occasional reassuring sound of the solenoid firing oxygen into the loop. Diving the rebreather has opened my eyes to a whole new level of diving. New challenges and experiences are a vital part of keeping interest in any sport and the Megalodon try dive with Peter Crane of Scuba-Tech Divers has certainly done that for me. Would I recommend it to others? I'll probably be lining up for another go myself! !